Editor’s note: This post was originally published on July 12, 2008, and substantially revised and republished on July 9, 2012. Like Jemima, today’s choice is one of those names heard from time to time in Europe, but virtually unused in the US. Thanks to Unknown for suggesting this charming moniker, a name that deserves some notice on our side of the Atlantic. Without further ado, here’s today’s Name of the Day: Saskia. She sounds like she ought to be a variant version of a more familiar name; maybe even a pet form of Alexandra. But Saskia is a formal name in her own right, and her origins are a bit on the violent side. 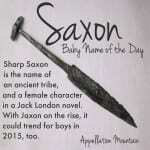 The name appears to mean simply Saxon woman. Dig into the etymology of Saxon, and you find yourself at the point of a knife. The Old English seax and Old German sachs referred to a characteristic short sword or dagger used by the tribe. Hard to believe such a pretty name came from such an aggressive beginning. And yet, it does give this name a certain edge that choices like Sasha and Sarah lack. 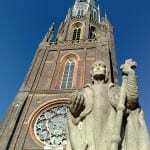 The most famous bearer of the name was Saakje van Uylenburgh, better known as Saskia, the wife and model of legendary painter Rembrandt van Rijn. Today, you’ll find images of the original Saskia hanging in many a museum, and her name remains in steady use among the Dutch. Both SAS kee ah and ZAS kee ah are valid pronunciations, but the “S” sound is the more intuitive choice amongst the English-speaking. A 1998 coming-of-age novel called The Saskiad told the story of a twelve year old girl named Saskia, eager to set out for adventure. Interestingly, there’s really no religious connection for Saskia. 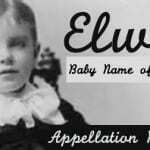 For parents hoping to avoid Biblical choices, saints’ names and appellations with spiritual meanings, this is one of the few that fits. Actress Anne Dudek – you might remember her from House – welcomed a daughter called Saskia in February of 2012, but that’s not quite the same as, say, Drew Barrymore choosing the name, so it is likely to remain safely under the radar. Saskia makes for a great alternative to the lovely, but oh-so-overused Sophia, and fits in with popular choices like Olivia and Amelia. Madame van Rijn adds some artistic flair to the moniker. It’s that rare find – easily pronounced but seldom heard, feminine and vaguely familiar but without baggage. We just named our daughter Saskia Gold. Gold is a family name and we liked how it sounded as a middle. People always ask how to pronounce Saskia, how to spell it, and then say “oh of course”. They also want to know the origin of the name. I chose it because I knew a Saskia who was a pastry chef and Zen bookstore owner, and could make French pastry while at sea on a sailboat with a kerosene stove – pretty cool! I also liked that it sounded feminine but not girly, and was easy but not common. Saskia is strong name! I’m from England so it’s said sas-key-ah and its a cut name :3 peeps call me Sas, sassy, sask, saskey! I love it and its beautiful! Proud Saskia! Lissa, if you’re still reading this: I’m Dutch, and as the post says, it is a very common name here (to the point of 80’s/90’s has-been). But I can imagine it sounds very fresh in the US. The Dutch pronunciation would be “Sas” with the ‘a’ from ‘large’ – “ki” as in ‘key’ – “a” like in Sophia or Olivia. Emphasis on SAS. So not like sassy, but not with two alike sounding a’s either. I’m curious about the pronunciation of Saskia, at least in the U.S. and Europe. It’s actually one of our top names for the baby girl we’re expecting in a few weeks and now I’m wondering if my pronunciation is correct! I have always pronounced it as if it were spelled Sahs-key-ah, where both a’s in the name are pronounced the same. This is opposed to pronouncing the first “a” the way it sounds in the word “sassy” – Sass-key-ah. I’m wondering if I’ve been pronouncing it wrong this whole time or if there’s consensus out there. Thanks! My name is Saskia and I love it. I live in Australia so it’s pronounced more like Sus-key-a as opposed to sas-key-a (as is sassy). My main nickname is just Sus, but I also get Sask and Sussy. Canadians may think of the Provence Saskatchewan or perhaps Sasquatch but that’s not a name stopper imo. I quite like Saskia. It is a very pretty name, and back in high school I knew a girl called this who was very quirky, intelligent and down to earth. She actually sometimes went by Saskie, which I prefer to Sass and Sassy. I’ve always loved this name. Its so spunky and it does have a particular allure. I love the Z pronunciation. Ultimately, both pronunciations are quite fantastic. Read about her in the novel “Sakiad” She thirteen, intelligent, and in my mind Lovely. Perhaps I would find even find her to be Mysteriously beautiful. I thought Saskia would be popular – and yes, Sass and Sassy are almost inevitable pet names, and very cute ones, too! Lola, you are absolutely a star – I swear you know someone by every name in the book! When I was first introduced to this name, I was dubious. SASKIA? What kind of name is that? I don’t know if I thought it was a recent invention or what, but I have since come around. I like it quite a bit now, and I love its fitting-in-yet-standing-out balance. & What about Sass as a quick name? – very sassy! Saskia is pretty awesome. I agree, it’s just about the perfect choice for people who want something different yet easy to wear. everyone else pretty much summed it up, so. 😀 Nice one for today. I know a Saskia too, but it’s her middle name. Her first, Pandora! (My MIL) I think it’s an awesome name and I adore the Rembrandt connection. Actually, if I could name a daughter Pandora Saskia, I would be thrilled to do so but she hates her name, & goes by Sue, I feel a bit funny thinking about it. The problem with my family is that there are no normal names, they’re all odd! I think Saskia makes an awesome name, short, simpple sounds, easy to spell, crisp, clear and above all, memorable. The lack of obvious nicknames is a bonus for some (not me but I know lots of them). Saskia would definitely stand out nicely in a crowd. As long as her surname isn’t Sachs (I know a few) too, I see absolutely nothing wrong with Saskia! I think it’s gorgeous! I’ve actually know a Saskia. She was born in Germany, but is a US Navy wife now! It’s a really nice name, but I could never use it. It’s too exotic for me and hubby. I can picture younger, hipper mothers than I using it, though. 🙂 Them, or maybe immigrants to the US who don’t feel like giving their children Anglicized names.